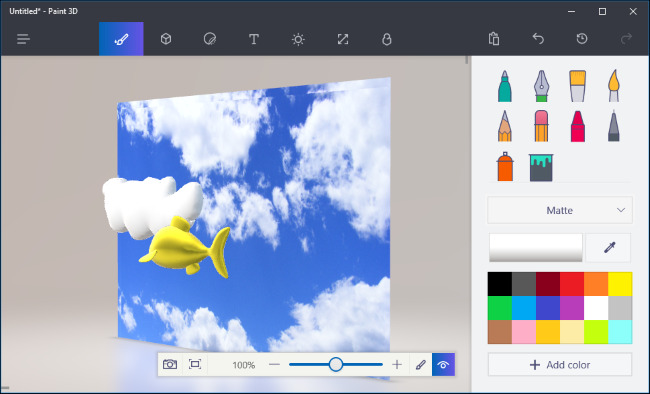 Paint 3D is a new application included with Windows 10’s Creators Update. You can use it to work with 3D models and put together 3D scenes. Your work can be shared online or even printed on a 3D printer. 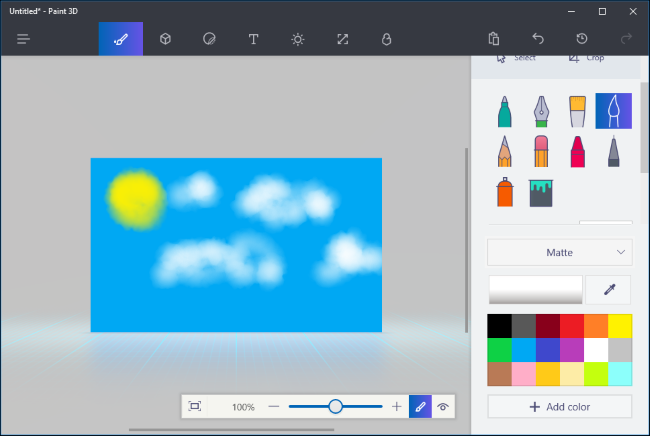 This isn’t just a new version of Microsoft Paint. It’s an easy-to-use 3D modelling application that lets you create your own 3D models and create scenes with multiple 3D models. 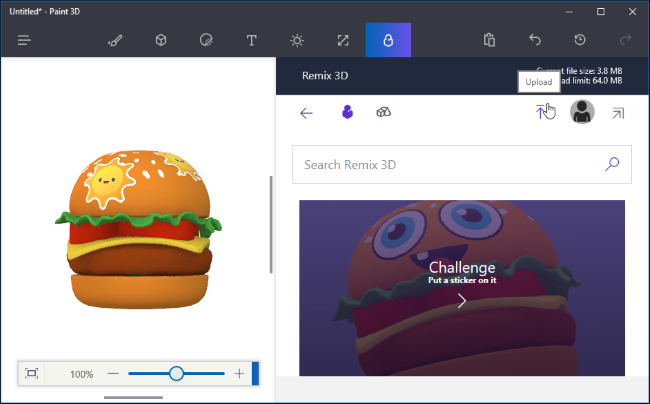 You can download models or scenes from Microsoft’s Remix 3D website or export your own to Paint 3D to share them with others. There are some more advanced features, too. For example, Paint 3D can export your scenes to .FBX or .3MF files so you can work on them in other applications. You can also import .FBX or .3MF files created in other applications. 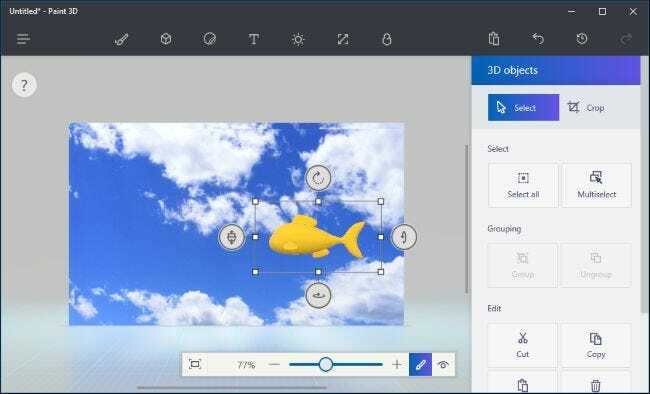 Paint 3D can print your scenes to a 3D printer using Windows 10’s 3D Builder application, too. Some of the most interesting features aren’t available yet. At the Creators Update launch event, Microsoft said you’d be able to export 3D models from Minecraft to Paint 3D, but that feature isn’t available in Minecraft yet. Microsoft also demonstrated using a smartphone to capture 3D objects in the real world and import them to Paint 3D. 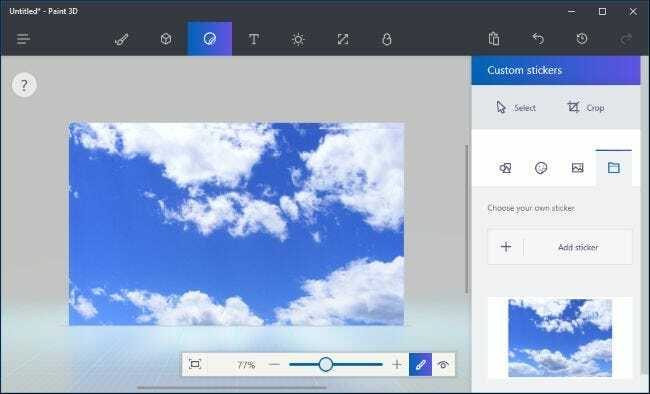 However, Microsoft hasn’t released these image capture applications and says they’re not a Creators Update feature. You’ll find Paint 3D in your Start menu if you’ve installed the Creators Update. Open it and you’ll see a welcome screen with a challenge, video, and tips and tricks to help you get started. You can watch the minute-long introduction video here, but it’s more of an advertisement video than a tutorial. The tips and tricks tile provide more specific instructions for using various features. Microsoft clearly wants you to get started with the “Put a sticker on it” challenge, so we’ll start there. You don’t actually have to do this, and you can skip the challenge (and skip this section of the article) if you’d rather just start exploring on your own. This particular challenge demonstrates how to import models from Microsoft’s Remix 3D website and modify them. 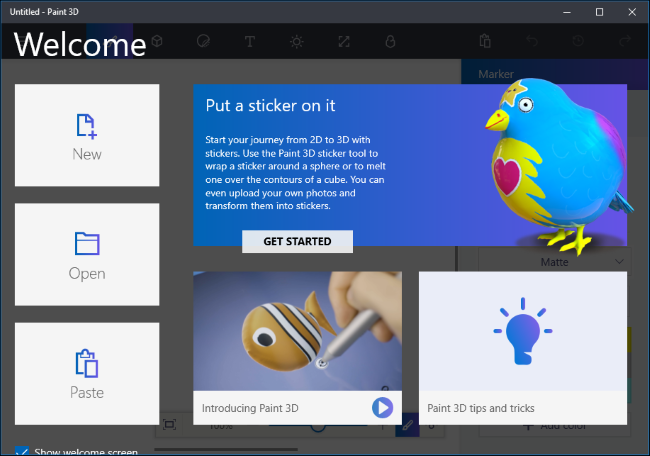 Click “Get Started” and then “Start Now”, and you’ll be taken to the Sticker challenge page on Microsoft’s Remix 3D website in your web browser. Select any model on the web page—whichever one you want to work with—and click the “Remix in Paint 3D” button. You’ll be prompted to sign in with the Microsoft account you want to use. 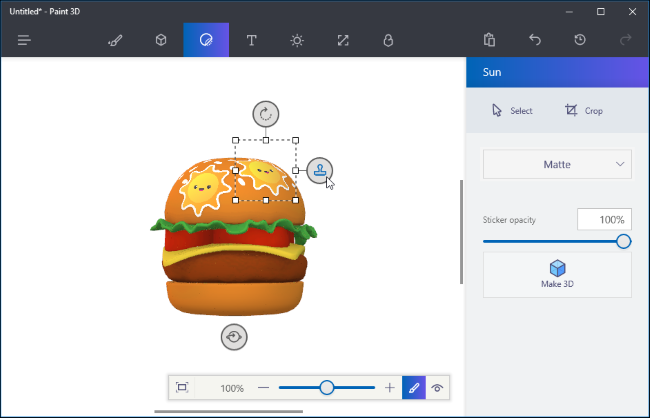 The model you chose will open in Paint 3D. Microsoft’s challenge is to add a sticker to it. To add a sticker, you’ll need to click the “Stickers” button on the toolbar—it’s the third one from the left. You’ll then find several tabs with different types of stickers and textures. To add a sticker, click it in the list and then click somewhere on the model. Click and drag to position and resize the sticker. The sticker will adjust itself to match the surface of the 3D model—you’re basically just applying a texture to the 3D model. Click the stamp button to apply a sticker. You can then apply it as many times as you want to different locations on the model. To view your sticker in 3D, click the “View in 3D” button on the right side of the toolbar at the bottom of the screen. You can then rotate the 3D scene by clicking and dragging with your mouse. This toolbar also allows you to change your view settings, zooming in and out. Click the “View in 2D” button to the left of the View in 3D button to go back to the 2D view. The challenge wants you to share your creation with everyone else, but you don’t have to do that. 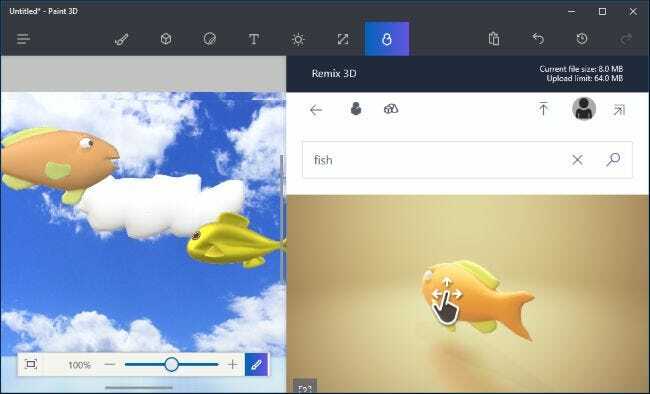 If you want to, you can click the “Remix 3D” button at the right side of the top toolbar to access the Remix 3D website and click the “Upload” button to upload your creation. 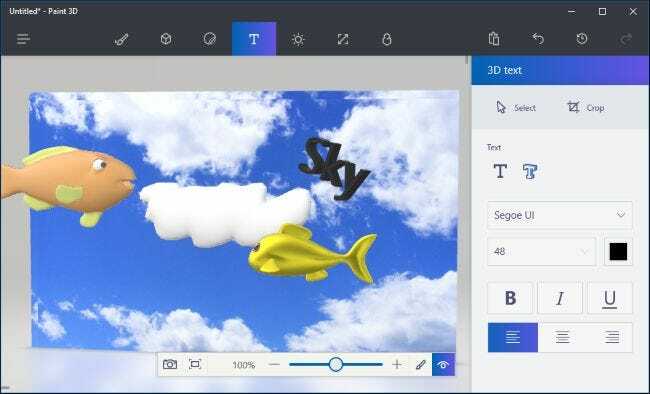 You can use Paint 3D in this way, if you like—just grabbing pre-made scenes and models from Remix 3D and modifying them. But you can also make your own objects. Let’s start from square one to give you a better idea of how this application works. To start with an empty scene, click “New” on the welcome screen or click menu > New to create a new scene. The first thing you’ll see is an empty white background. This is your canvas, which is the background image that appears behind your 3D scene. You can use the tools on the Tools pane—that’s the first icon from the left—to quickly draw a background. 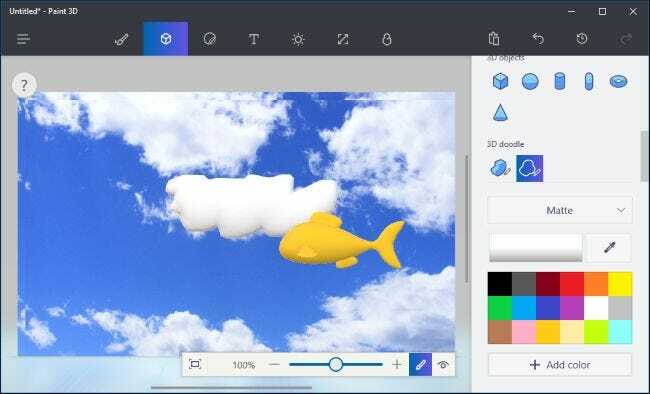 For example, here we’ve used the bucket-shaped fill tool and the paint-brush-shaped watercolor tool to quickly fill in a blue sky, a sun, and some clouds. It’s truly in keeping with Paint 3D’s Microsoft Paint heritage. You can use the Canvas pane—that’s the sixth button from the left on the top toolbar—to resize the canvas, if you want to make it larger or smaller. Let’s be honest: Our background doesn’t look very good. 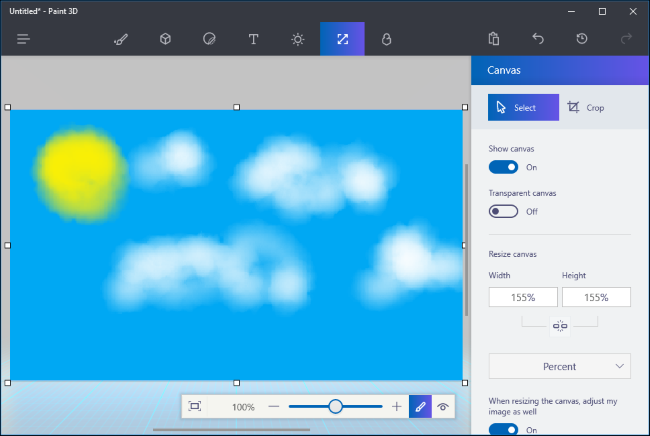 Paint 3D doesn’t exactly give us a lot of tools to create a good canvas image, but it does let us import a photo or image from another application and use it as our canvas background. First, you’ll need to find an image you want to use and download it to an image file on your PC. Next, click the “Stickers” icon on the toolbar—that’s the third icon from the left—and click the “Custom Stickers” button on the sticker pane. Click the “Add sticker” button and select the image file you want to use. Position and resize it to match your canvas and click the “Stamp” button. This will apply the image you chose to your canvas and you’ll have a nicer looking background. There are several ways to insert 3D objects in your scene. 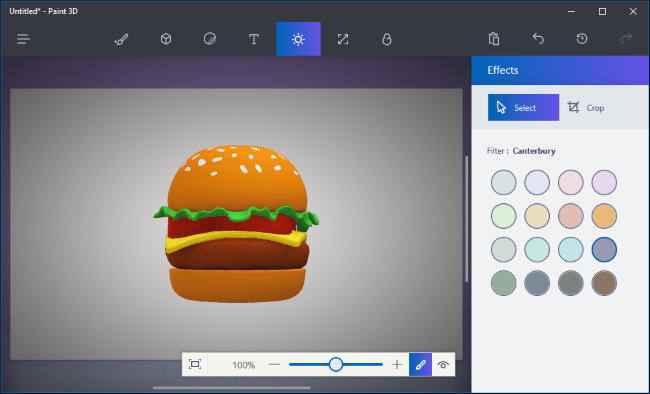 You can use Paint 3D’s integrated tools to create basic 3D models, add advanced 3D models from Remix 3D, or insert 3D model files created in other applications. 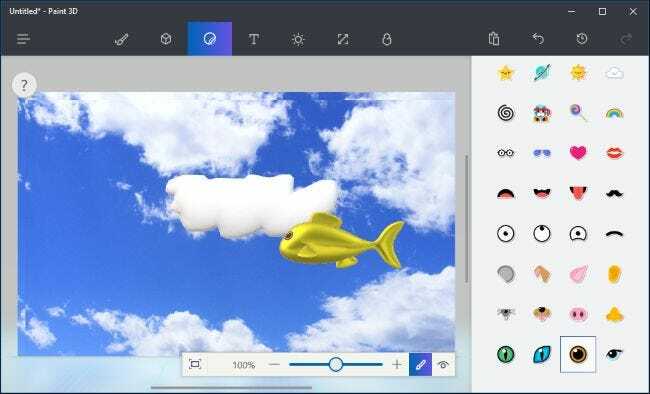 Paint 3D supports files in either 3MF or FBX format. To start creating your own 3D models, click the “3D Models” icon on the toolbar—that’s the second one from the left. You’ll be able to choose between basic 3D models, simple 3D object shapes, and a 3D doodle tool. To insert a 3D model or object, click it on the 3D models pane and select a color. You can then click somewhere in your scene to place the model. You can use your mouse to resize or re-position the object. Use the other buttons around the object to rotate it in various directions and adjust its distance from the canvas in the scene. When you’re done, just click outside the model. You can then click the “Select” tool and click the model afterwards to select it and adjust it. 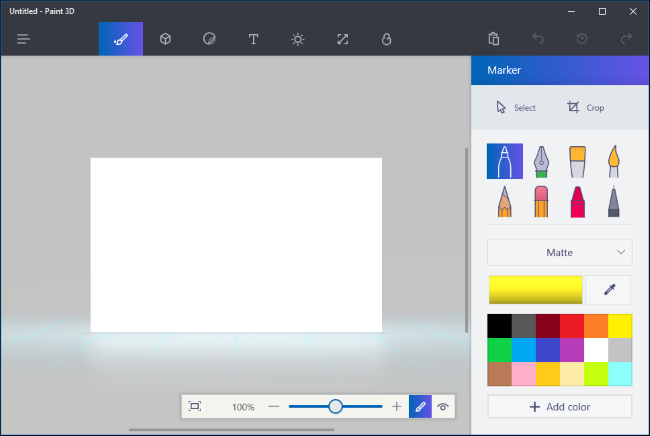 The 3D doodle tools on this pane allow you to quickly draw your own 3D models. There’s a “Sharp edge” tool that will create models with sharp edges, and a “Soft edge” tool that will create models with softer edges. For example, you might want to use the sharp edge tool to draw a rock and the soft edge tool to draw puffy clouds. Just click and drag with the mouse and Paint 3D will create a model that roughly matches what you drew. Here, we’ve used the soft edges tool to draw a cloud and placed it behind our other model in the scene. To paint your models, click the “Tools” icon on the toolbar—that’s the first one from the left—and choose your settings. You can select many different types of brushes and textures, including dull and polished metal, as well as a color. For example, if you wanted to give your model a polished, golden look, you could select “Polished metal” and a yellow color here. You could then click the paint bucket icon and click the model once, which would paint its entire surface with the color and texture you chose. You could also select different brushes here to paint smaller parts of the object’s surface. At any point in time, you can click the “View in 3D” button on the bottom toolbar to view the entire scene in 3D and click and drag to move your view around. Click the “View in 2D” button to the left of it to go back to the 2D view. 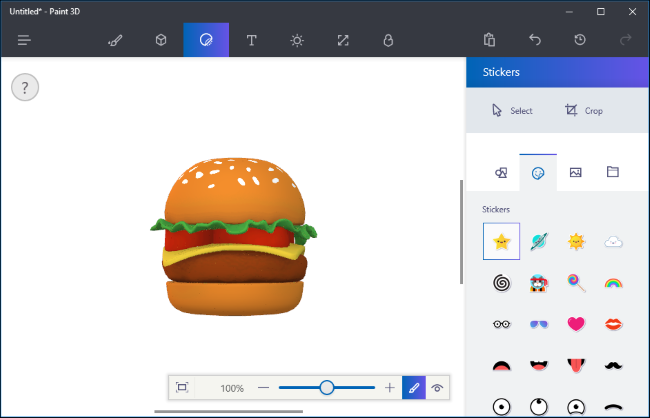 You can also apply stickers and textures to an object using the Stickers pane—that’s the third icon from the left on the toolbar. 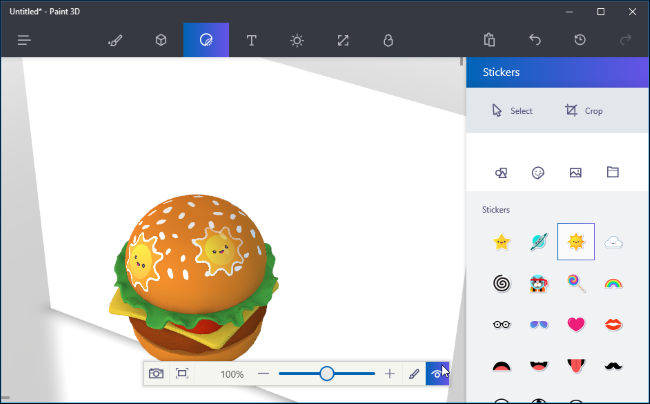 Paint 3D provides you with some basic stickers you can use, but you can also choose to import an image file and apply it as a texture to your object, just as you can with the canvas background. Rather than creating all your own models, you can click the “Remix 3D” icon on the toolbar—that’s the last one on the right—and search for models other people have created. The “Place in Project” button on the pane will place a model from the website directly into your scene. You can re-position, rotate, paint, and apply stickers to models you insert in this way, too. Note that each Paint 3D scene can only be 64 MB in size, maximum. Your current scene’s size and the limit are displayed in the Remix 3D pane. Many of the models on the Remix 3D site are fairly large and will quickly increase your project’s size. Finally, there’s also the Effects pane—fifth from the left on the top toolbar—which allows you to choose a colored lighting effect. You can only choose a single effect that will be applied to your entire scene. 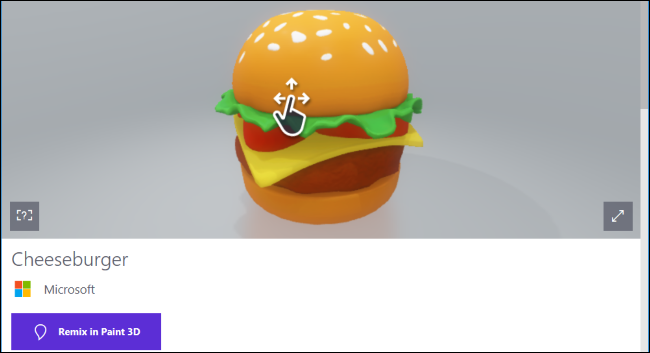 When you’re done, you can click menu > Save to save your project to a local file or Upload to Remix 3D to upload it to Microsoft’s gallery. 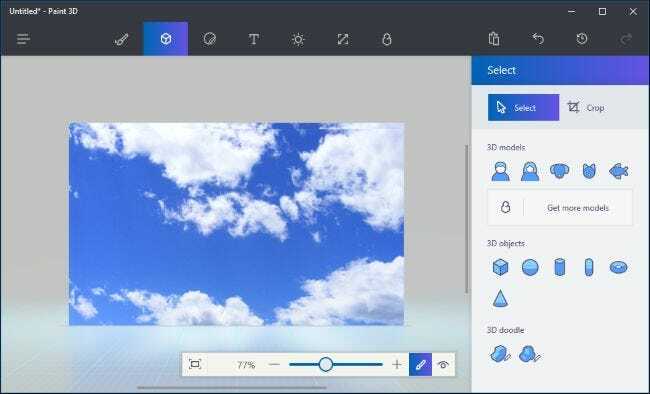 The Print option in the menu will open your 3D scene in 3D Builder so you can print it to a 3D printer.